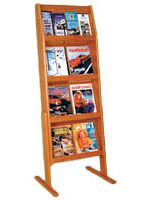 This upright wooden information stand has a design with 4 open shelves stacked on top of one another to showcase more magazines in a smaller space. 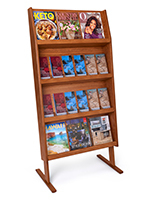 The freestanding literature displays have 18” wide tiers that are 4.75” deep to accommodate thicker periodicals, catalogs, or books. 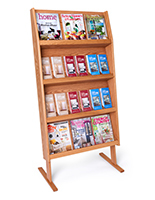 The information stand with solid oak construction is finish with a light oak stain that looks great in any office or retail setting. 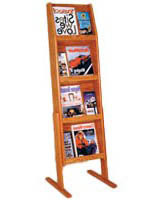 The design of the shelves allows for both brochures and magazines to be on display at the same time. The stand is 56” tall and is able to help organize libraries or a client waiting room. 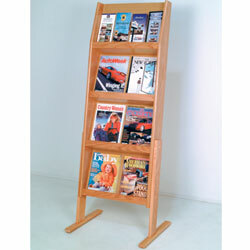 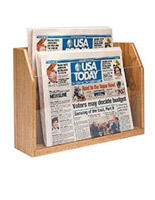 The freestanding literature display is durable and will last for many years. 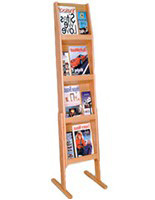 32.0" x 56.0" x 4.8"
18.0" x 11.5" x 1.3"